When Magnus Carlsen, the reigning World Champion from Norway, and Sergey Karjakin, his Russian challenger, face off in the title match this November in New York City, it will be the dawn of a new era in chess. It will be the first time that none of the players of the older generation, represented by former champions like Viswanathan Anand of India, Vladimir Kramnik of Russia, and Veselin Topalov of Bulgaria, will be competing for the title. Carlsen, 25 (who will be 26 at the end of the match) and Karjakin, 26, will also be the youngest duo, by combined age, to compete for the championship. They are leading representatives of a generation that has grown up with powerful chess computers that play better than humans and that have influenced how people train and play the game. And, waiting in the wings, are even younger potential champions, including Fabiano Cauruana of the United States, 24; Anish Giri of the Netherlands, 21; and Ding Liren, 23, and Wei Yi, 16, of China. These players, and a handful of others, are likely to dominate the game for the next decade. Despite the far-reaching impact of technology on chess, the new generation is not a group of clones. Their styles and approaches to the game remain varied and are reflections of their personalities. Indeed, the match-up between Carlsen and Karjakin is not exactly a contrast in styles, but each player has strengths and the outcome of their battle will probably hinge on who can steer the games into situations in which each is more comfortable. 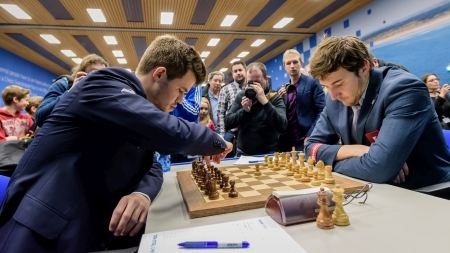 Round 8 of the 2016 Tata Steel Chess tournament, the last match between Magnus Carlsen and Sergey Karjakin. The game ended in a draw. Carlsen excels in positions that require a great deal of accuracy and technical skill. Karjakin is a skilled defensive player who does best when he can surprise his opponents in the opening or tip the games into slightly messy positions where the path forward is unclear. Their career head-to-head record in slow, or classical, games favors Carlsen, but at 3 wins to 1, with 15 draws, he does not have an overwhelming advantage. It is significant that Karjakin's victory, which was in 2012 at the elite annual Tata Steel tournament in Wijk aan Zee, the Netherlands, was a game in which he was able to destabilize the position and Carlsen went astray. The notes to the game are based on analysis that Karjakin did for Chessbase Magazine. Carlsen will clearly be favored in November - he has the higher ranking and more match experience, having played, and won, the last two World Championship matches in 2013 and 2014. Still, no matter who wins, the match will represent a distinct new chapter in the 1,500-year-old game.